MGBW continuously invests in technologies to make operations ef? cient. 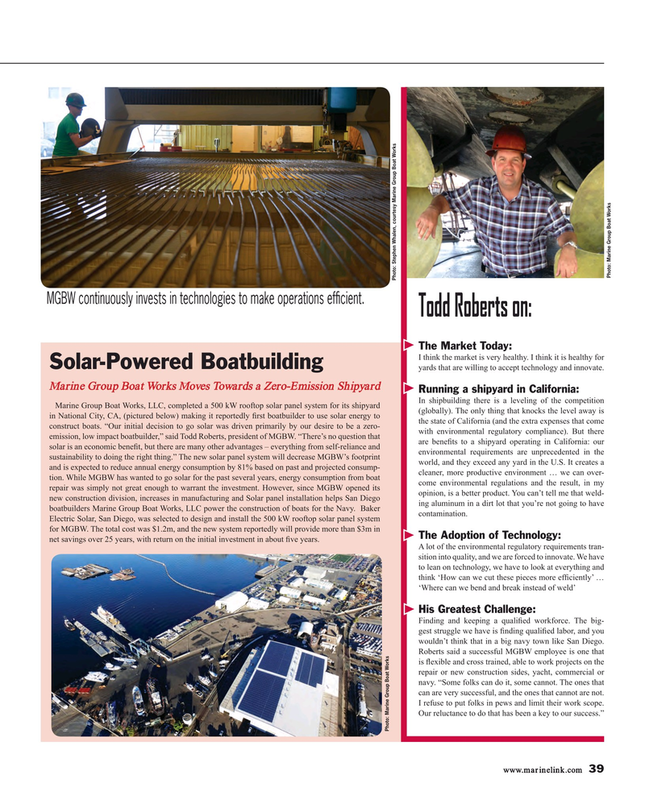 Solar-Powered Boatbuilding yards that are willing to accept technology and innovate. Marine Group Boat Works, LLC, completed a 500 kW rooftop solar panel system for its shipyard (globally). The only thing that knocks the level away is in National City, CA, (pictured below) making it reportedly ? rst boatbuilder to use solar energy to the state of California (and the extra expenses that come construct boats. “Our initial decision to go solar was driven primarily by our desire to be a zero- with environmental regulatory compliance). But there emission, low impact boatbuilder,” said Todd Roberts, president of MGBW. “There’s no question that are bene? ts to a shipyard operating in California: our solar is an economic bene? t, but there are many other advantages – everything from self-reliance and environmental requirements are unprecedented in the sustainability to doing the right thing.” The new solar panel system will decrease MGBW’s footprint world, and they exceed any yard in the U.S. It creates a and is expected to reduce annual energy consumption by 81% based on past and projected consump- cleaner, more productive environment … we can over- tion. While MGBW has wanted to go solar for the past several years, energy consumption from boat come environmental regulations and the result, in my repair was simply not great enough to warrant the investment. However, since MGBW opened its opinion, is a better product. You can’t tell me that weld- new construction division, increases in manufacturing and Solar panel installation helps San Diego ing aluminum in a dirt lot that you’re not going to have boatbuilders Marine Group Boat Works, LLC power the construction of boats for the Navy. Baker contamination. The Adoption of Technology: net savings over 25 years, with return on the initial investment in about ? ve years. Finding and keeping a quali? ed workforce. The big- gest struggle we have is ? nding quali? ed labor, and you wouldn’t think that in a big navy town like San Diego. Roberts said a successful MGBW employee is one that is ? exible and cross trained, able to work projects on the repair or new construction sides, yacht, commercial or navy. “Some folks can do it, some cannot. The ones that can are very successful, and the ones that cannot are not. I refuse to put folks in pews and limit their work scope.